Scott Bradley began studying the guitar aged 7 with local teacher Pat Robinson. His talent was recognised early and his teacher directed him towards world class players for further study. By the time Scott was a teenager he had studied with many guitarists of international reknown such as John Duarte, Stepan Rak, Neil Smith and Simon Dinnigan. He spent 4 years studying at Trinity College of Music with Gilbert Biberian and then Nicola Hall. While there, he attended master classes with Ricardo Iznaola and Alirio Diaz amongst others. After graduating he continued his studies by taking lessons with Nikita Koshkin, Alan Neave and Craig Ogden. Performances have included several concerti such as the Concierto de Aranjuez, Giuliani’s Guitar Concerto in A and Tedesco’s Concerto in D. He has also performed in operas and many other forms of chamber music. 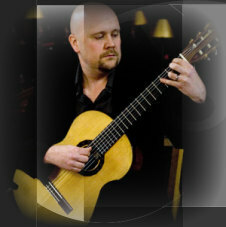 He has given a number of world premiers of solo and chamber works for guitar and has commissioned works such as Dance Rhapsody by Chris Dumigan following a successful premier of Woodland Arabesque by the same composer. Scott has performed often on BBC radio as a live soloist and has played at prestigious venues such as Regents Hall and the Venezuelan Embassy in London. Scott occasionally performs with his brother Craig, in a guitar and bayan accordion duo. During his time between performances, Scott works as an examiner for Trinity College London. He has been invited to examine on many prestigious foreign tours to such places as South Africa, Italy, Portugal and India. As well as this, he still manages to hold down a substantial teaching practice. Scott is fast building a reputation as an outstanding performer with a unique and engaging style. He has been described by the Classical Guitar Magazine as playing with, “uncompromising interpretation” and while still in his 20’s was described by Nikita Koshkin as “already a virtuoso player”.